Stalls from 11, Performances from 12.30, Rally at 2 pm! This September 8th, thousands of communities from all over the world are Rising For Climate in a Global Day of Action! Multiple organisations in Cambridge, including Pivotal, have teamed up to stage a powerful action that will send a message to the County Council, the University and the Government. We demand immediate political action! During the day, from 11am, there will be stalls and performances at the Market Square. 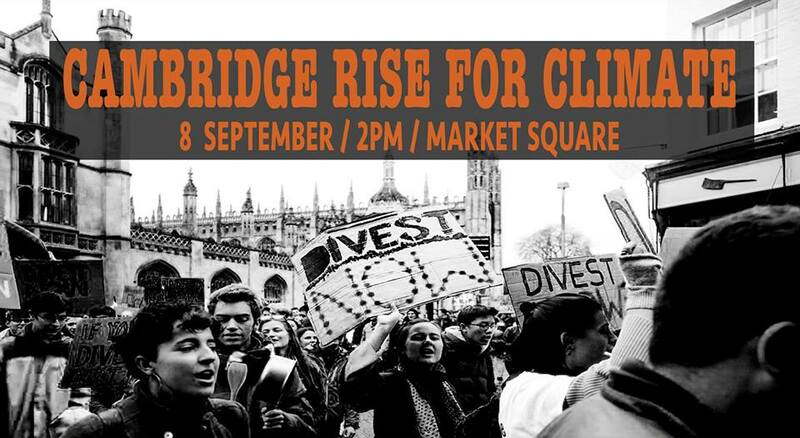 Join one of our discussions, learn more about climate justice and how can you get involved in any of the campaigns in Cambridge. Be part of it! About the Action: The Climate Crisis is here, and it is just getting worse. 2018 has shown the true colours of climate change. Devastating extreme natural events have swept across the globe: record-breaking drought in South Africa, Brazil and Australia, catastrophic floods in India, gigantic wildfires in Greece, Sweden and California, and deadly heat waves in Southern Europe, Japan, Southern Asia and Quebec. And yet, what we have seen this year is just the tip of the iceberg. Climate change has been affecting the world's most vulnerable communities for decades. Severe drought has led to ubiquitous famine in East Africa; climate-induced displacement of herdsmen in Nigeria has contributed to a brutal civil conflict there; and sea level rise is forcing Pacific Islanders to leave their homes, cultures and identities behind. In a cruel irony, the people most affected by climate change so far have been those least responsible for it. Climate change is not only the greatest threat to humanity, but also one of the greatest injustices of our time. Climate injustices exacerbate the systemic oppression of poor people, people of colour, and women. It is clear that the current socioeconomic system has failed for people and planet. Solving climate change, and fighting its entrenched injustices, demands system change. Historically, the city and University of Cambridge have significantly contributed to legitimise this rotten system that upholds colonial, patriarchal and neoliberal values that have led to the current Climate Crisis. And it still continues today. The University and the County Council continue to invest millions of pounds in the fossil fuel industry, the single industry most responsible for climate change. This is why here in Cambridge we say stop investing in the destruction of people and planet. Enough is Enough. We Rise for Climate. The severe drought that has turned our green and pleasant Britain unrecognisably hot and yellow has now brought the climate crisis to our doorstep. When it is almost too late to react, we recognise that the current climate emergency threatens the harvest and leaves our national food security gravely vulnerable. Meanwhile, the Tory Government has liberalised fracking regulations against the overwhelming will of the citizens. We strongly reject the authoritarian move of the Tories. We will put our bodies on the line to protect our water, our land, our communities and our democracy. This is a climate emergency, and we have to act accordingly.